Sarah Riddlemoser was our architect for a major addition we put on our house. We hired her because we were really impressed with her work and felt like she’d be great to work with- we were right in both accounts! Sarah took our “wish list” and turned it into a gorgeous design. She successfully navigated the zoning process when we needed a variance and was flexible and accommodating as things shifted during the project, as they tend to do during a major Reno. The best part: we are absolutely thrilled with the outcome. Can’t recommend her enough. 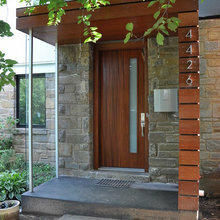 We hired Sarah at Moser Architects to design an addition and renovation of our 1940 Colonial. 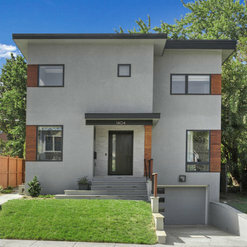 Our project was completed in July 2018 and we couldn’t be happier with the result. From beginning to end Sarah was a true partner with us in the process. She listened to our objectives for the project and with her incredible vision transformed them into a home for our family that is both functional and beautiful. Her professionalism and guidance throughout the Arlington County approval process and construction management phase were invaluable. Her design and style advice are unsurpassed. Sarah is extremely talented, patient, and easy to work with, and we know that we could not have achieved the results that we did without her. Without question we would hire her again and recommend her to others without hesitation. 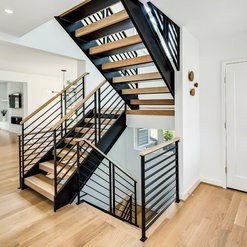 We are so lucky to have found Moser architects, and working with Sarah was not only easy, it was the key component to ensuring our dream renovation could come true. We recently renovated our single family home in South Arlington, and her design, professionalism and attention to detail were exceptional. We could tell in the drawings, but ultimately now appreciate it more than ever now that the job is done. We see new lines and angles that are so well thought out and we would have never envisioned ourselves. She is also a great project manager and ensures the project stays on track. 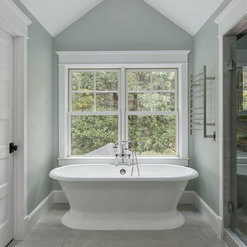 We now have a renovation that is subtle, fluid, and integrated with our old home. We receive countless compliments from people saying how the entire home feels as one, not old, and new. We feel the same. 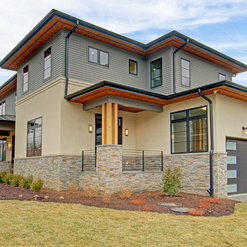 Her relationship with our builder Merit Homes, was also a key component. Together they produced a renovation far beyond our expectations. We would recommend Moser for any project. 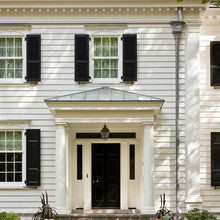 We hired Moser Architects in the spring of 2016 to design an addition to our Arlington colonial. Working with Sarah was an absolute pleasure, and I would highly recommend her to anyone looking to hire an architect. I love how Sarah transformed our 70-year old house into a beautiful new home while maintaining the integrity of the original colonial design and working within our budget constraints. 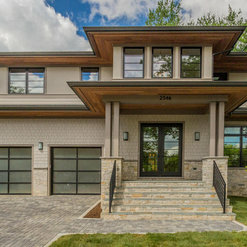 We consciously chose to hire an architect and a separate builder rather than a design-build firm and it was one of the best decisions we made. We knew that was perhaps the more expensive option, but it was well worth it. We did end up choosing a builder that she recommended and it was definitely the right choice for us. The design process took several months and construction was completed in about 5 months, which was as promised. Sarah went above and beyond her duty as an architect. She was there whenever we needed her, all the way through the completion of the process. We really appreciated having her professionalism and design sense when it came to advocating for us with our builder. 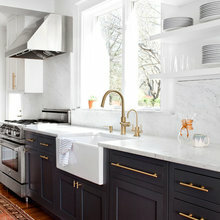 In addition, Sarah was always willing to give her design advice and answer all my questions well beyond her initial designs—even happy to go along on my tile shopping adventures or take a phone call from me while I was out of town agonizing over pendant light choices. Most importantly, Sarah was fun, creative, trustworthy, and responsive. Renovating a house can be a very daunting process, but having Sarah alongside made it a very smooth and worthwhile experience. 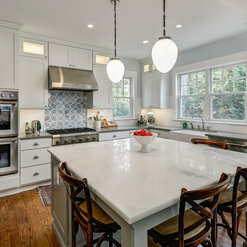 We worked with Sarah at Moser Architects on a major renovation project, and she did an incredible job helping us gut, reconfigure, and expand our late 40's Cape Cod-style home. She was consistently attentive to our priorities, and helped us identify savings opportunities throughout the process...without compromising the look/feel of the final product. Neither of us had never done a project anywhere close to this scale before, and as daunting as a whole-home renovation is, Sarah helped alleviate our stress by acting like a true partner throughout. 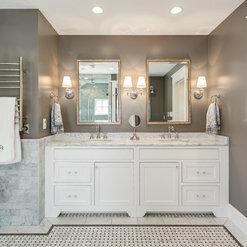 She responded promptly and thoughtfully whenever we had questions or suggestions during both the design and construction process, and offered helpful suggestions when we were selecting tiles, cabinets, and fixtures. During construction, Sarah came to the job site whenever we needed her to be there, and was an active participant/advocate during our regular meetings with our general contractor. During the few instances in which site conditions required adjustments to her original drawings, Sarah worked with us to come up with creative, yet practical solutions, and delivered the revised designs to the contractor in a timely manner. 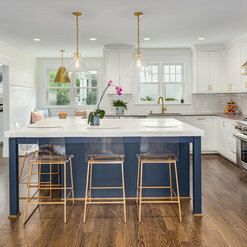 Sarah's design retained the best elements of our home's original character, while seamlessly blending them into the newly expanded parts of the home, giving us much more family-friendly living spaces on each of the floors without making the house look like a massive box from the outside. 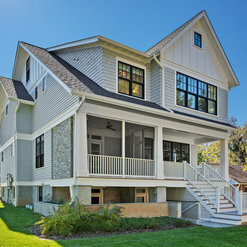 Moser Architects transformed our 3 bedroom, 2 bathroom, 1947 colonial into an open floor plan home with 5 bedrooms, 3.5 bathrooms including a laundry room upstairs. We honestly could not be more happy with the result. The owner, Sarah Riddlemoser is absolutely wonderful to work with – from start to finish. She took our list of requirements and created a space we could not love more! She was there for us every step of the way. 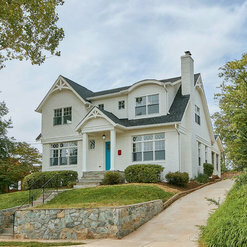 She is a master at dealing with the county and getting permit approval (which is truly critical in a tough county like Arlington), did a great job managing our bid process and worked extremely well with our builder from demo to completion. Sarah stays with you throughout the entire construction process to ensure the project is being done right, and she was our advocate throughout the process to make sure we were happy with the end product. Her designs are thoroughly thought through from every angle. She was always extremely open to our feedback and always looking for the best way to accomplish our goals through creative, cost sensitive solutions. She really made the entire process fun and enjoyable. Now that it’s over we miss our daily/weekly check ins with Sarah. 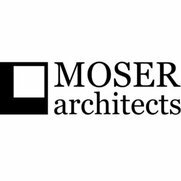 You cannot go wrong with hiring Moser Architects! 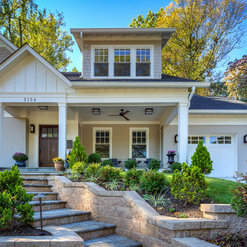 Sarah Moser designed the plan for our newly purchased Lyon Village home, transforming it from an outdated center hall colonial into the bright, open floor plan we had been hoping for. She was integral from the start, walking the house with me when it was on the market to see if we could create the features we desired: moving the stairs from the front; opening the foyer to a wide, welcoming space; constructing a family room with high ceilings; adding a second floor laundry room; carving out a dedicated kid's lounge in the attic; designing a functional yet spacious eat-in kitchen; and adding a screened porch and deck. She was an effective liaison with the county, was great at addressing problems with creative solutions as they arose, and never balked at providing requested customer service. From the grander plans through the decorative details, Sarah helped us with anything we asked of her.